Its here. We are smack dab in the middle of a place where stream water is scarcely moving and the cool autumn winds haven’t arrived to catch the sails. July and August. Although there is still good trout fishing up north, we are about done around the southern part of the state. 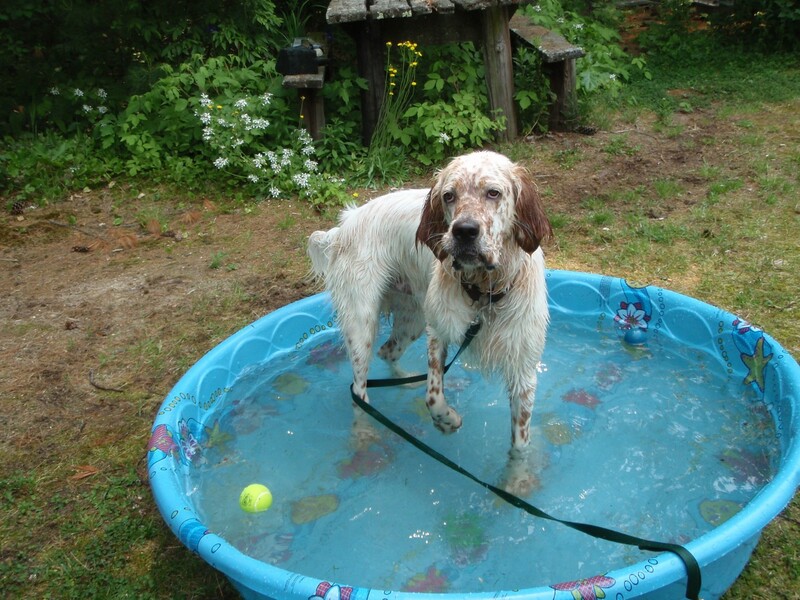 Its still too early to run dogs on wild birds for fear of heat, ticks, rabid toads and upsetting young birds, so– For the dogs, we have yard work, garden hoses and the wee plastic pool out back that makes for some pretty good fun and cooling. 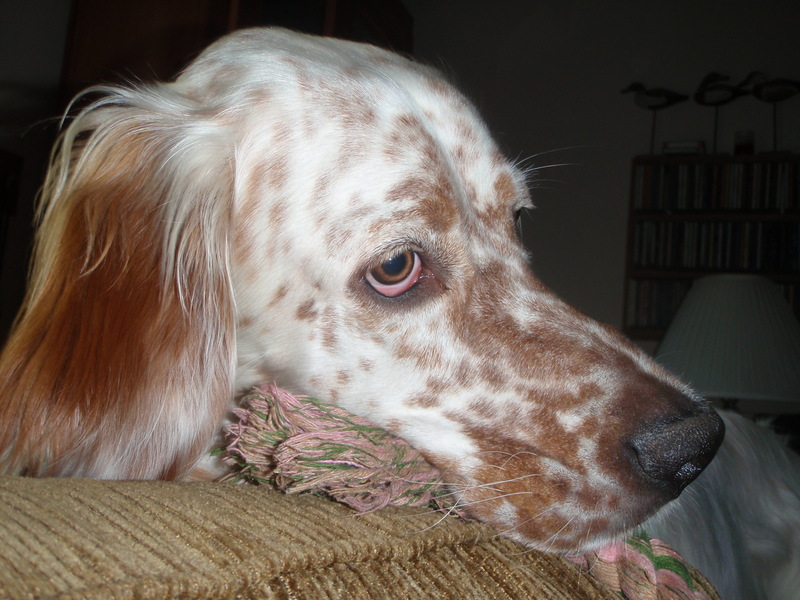 I wish I had more pictures to tell the story, but its entertaining to watch Tucker watching Bromley as if to say, “you silly pup”–as he sets by being his aloof self. I think Tucker knows that fall is around the corner, but Bromley doesn’t yet know what is coming. Unless of course, you believe that an innate knowledge of the connection between the doldrums, cooling weather and grouse are passed genetically. I tend to think this is the case. Maybe you do too. It would explain some things such as the dogs longingly staring at my shotguns and vest and an increased interest in grouse and woodcock body parts laying around the study. 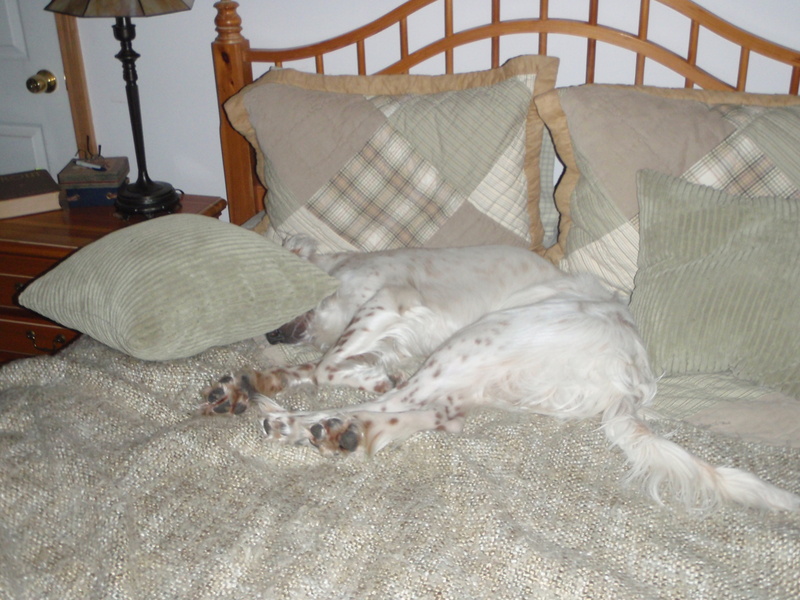 It is a good time for storing up energy inside where its cool and just generally looking like English Setters do during the doldrums. For me its a good time to be cool inside and tie some new flies and get ready to start a new job. Yee hah! Finally. I digress, but just one more word on that subject. I’ve enjoyed a break in the form of semi-retirement and more fishing and time with the dogs, but not having any extra money limits options, so in balance–well there is balance. Anyway, before long the nights will begin to cool, the shadows will grow longer, the days shorter, birds will fly and we’ll be walking the crisp forest floor and cool streams again. I don’t much like the doldrums of summer, but I reckon they do serve to make what follows all the better. All the same if I had my way we’d just skip it–and I’m pretty sure the dogs would to. Cool moving water and a breeze to make the doldrums pass. ~ by John McGranaghan on July 14, 2010. Hmm, rabid toads. That’s a new one. I wouldn’t under estimate the rabid toad problem if you are out and about in the NH woods. Snake boots are a good idea and you should avoid reaching into bushy areas and toad holes without good leather gloves. The larger ones have been known to jump and chomp at thigh level, but this is rare. The pups seem to avoid them naturally. Some kind of excretions, I suspect. 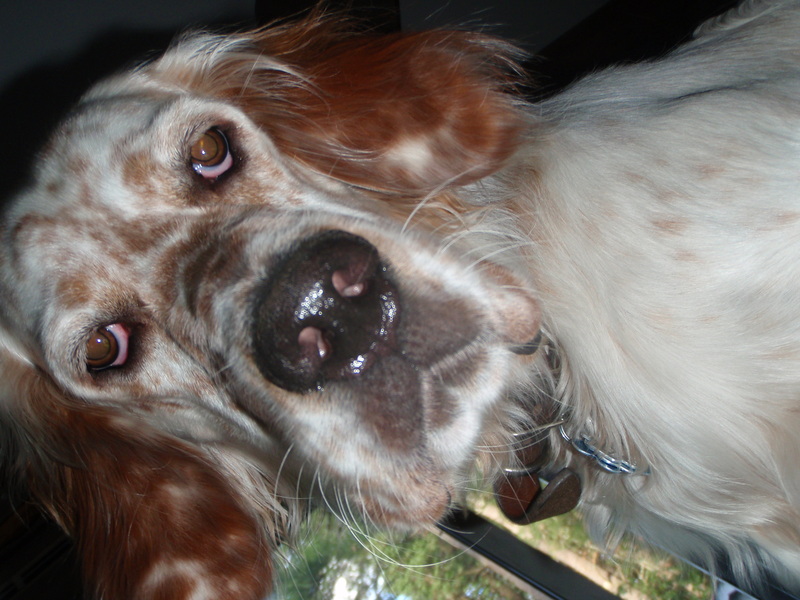 Put those ol’ Setter Dogs to the test…now that’s worth their mettle! I’d like nothing more than to head west again one day and with the dogs during hunting season. Tucker the Llew is strong as a tasmanian devil on guarana root and would likely do decent chukar work and Bromley can cover 30 yards per stride without the root. Mettle would be rendered and birds hunted up–I have no doubt. Nice looking dogges! Brom has no idea what he is in for, I’m sure Tuck will show him a thing or two in your NH coverts. How was your flush rate up there last season? Came down 16 from Rangeley through Erroll last week, outstanding area. Must be loaded with Thunder Kings. Do you ever get down into Upstate, NY with the pups? THe last two years, we have seen quite a few more grouse in the bottom half of the state. This may have something to do with Tucker’s desire and nose and also finding some new covers that no one else hunts–but for three generations of a family that mainly hunts deer and will occasionally take a grouse. I’m encouraged by this for Bromley’s sake and when considering the great brood weather, I’m nearly excited. I’m hesitant to say much about it, but I have never seen a young pup with such characteristics as Bromley has. 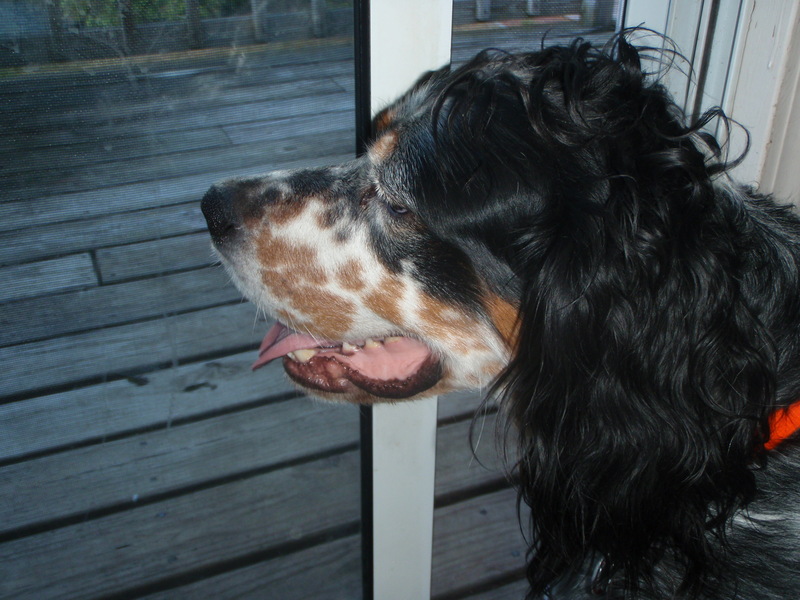 Nose, attentativeness to me, pointing instinct and caution with birds. At the end of last season when he was about five months old, he had about a dozen grouse contacts and set every one and was steady to flush each time and that naturally. He figured out why we were out there right off the bat. I can hardly wait to get him out on wild birds to see how he does since aging a bit. I intend to pretty much leave him and the birds to themselves. I have not been to NY with the pups, but I suspect that might happen before too long. I also intend to make a trip or two to Maine and Northern NH to give Bromley more opportunity. That is great news all the way around. Cedar is the same age as Brom and he is anything but steady to flush, tends to creep and cat walk. He had several staunch points on the doodlers this spring but when I put them up he was off to the races. Good nose and attentive until he is locked on game, then all bets are off. Like you I am going to let him sort it out. If you ever head to NY holler at me, we have some killer covers that are filthy with ruffs. Dave–I just found your blog and have added it to my list, here. Cedar is a fine looking dog. I’ll be following your exploits this year. ‘Filthy with ruffs sounds like fun’. Good for you and the pups! Many thanks Parker, he is a gem. Is Brom an OH? Yes–he is an Old Hemlock. 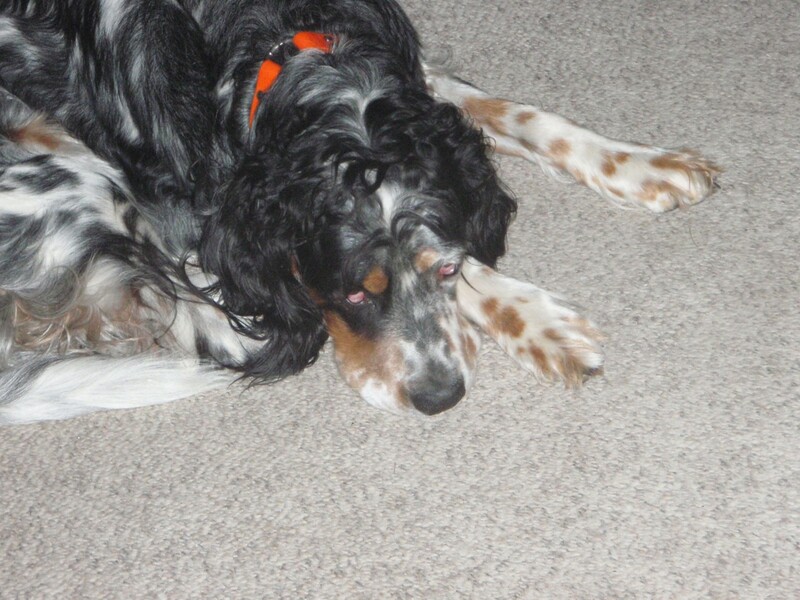 His dad is OH True and mom is Becasse a Ryman from Setters West breeding.